Sewing a quilt doesn't sound like it would make for particularly exciting gameplay, yet Patchwork turns the simple task of selecting patches to fill a blanket into a nerve-wracking competition. In this two-player mobile game, you and your opponent take turns selecting tetromino-shaped swatches of fabric to add to your quilt. The goal is to complete as much of your quilt as possible before reaching the center of a spiral track on a game board. Each patch costs a certain number of buttons to purchase, and will move you a particular number of spaces along the board. It's tempting to simply buy the biggest patch available or scoop up that one that fits perfectly in that one awkward spot, but there's more to consider. Patches with buttons sewn into them award you more buttons with which to buy more fabric; the most helpful pieces tend to force you around the board more quickly, which means you won't get as many opportunities to actually spend those buttons. The rules of Patchwork are simple, but create elegant layers of strategy that gradually become evident as you play. The player who's behind on the board is the one who gets to take a turn, so it may be smarter to claim the smaller patch and take advantage of the extra turn you get by not moving past your opponent. Then again, the larger patch might have three buttons sewn into it, which will be a big help in the later game when fabric becomes more expensive. Then again, you may simply want to pass; skipping your turn automatically moves you one square past your opponent, granting you a button for every square you skip in the process. Deciding which patches to use is tricky, but actually sewing them into your quilt is a snap. Just drag the patch to your blanket, use the buttons to flip it or rotate it until it's oriented exactly the right way, and hit another button to stitch it up. You've fit puzzle pieces into a grid a zillion times before, but there's something satisfyingly tactile about watching the thread make its way around the fabric as your choice is made permanent. It feels like a just reward for all the fretting you're doing as you attempt to out-score your opponent. 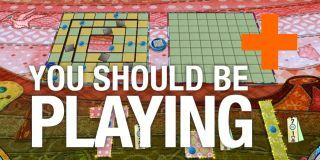 It takes a few rounds to really understand the implications of Patchwork's rules and systems, but each game only lasts a few minutes, so you'll start to know what you're doing fairly swiftly. Once you have a handle on your stitchery, you can keep playing the AI (which is clever enough to give you a healthy challenge), test yourself in a ranked game, or play with a pal online or locally. The AI comes in three different difficulties, letting you scale up or down as needed for your skill level (or mood). This is a perfect game for play-and-pass on a tablet. I personally found it difficult to parse all of the game's information - the game board, your points, your blanket - on a phone screen, but if your screen's big enough (or your eyes are good enough), you may not have similar problems. Competitive mobile games tend to rely on decks or dice or words, all of which are great, of course, but they tend to feel a bit samey. Patchwork feels utterly fresh while relying on familiar enough mechanics to make learning it a breeze. Strategy games are often tough to scale to still be fun for a variety of player experience and temperaments, but Patchwork gets everything exactly right. And you can buy DLC to adorn your fabric with dinosaurs or kitties. I mean, come ON.